When analyzing data you will almost always want to view it by distance rather than time. For example, looking at speed over the course of a lap based on how far around the lap the motorcycle is by distance, not time. This is not such an issue when dealing with one lap in isolation, but when comparing two or more laps it’s always best to base the graph on distance, not time. This chart shows two laps of the same track versus time, with one lap a few seconds quicker than the other. Note that over the course of the laps the two traces shift, making any comparison difficult. This chart shows the same data for the same two laps but plotted versus distance as opposed to time. We can accurately state the speed for each rider at any given point on the track, and quickly make a valid comparison based on this graph. If, for example, we look at two riders’ speed traces for two laps around the track, we would be able to give each rider’s speed at any given point on the track-a worthwhile comparison. However, if looking in the time domain, we would only be able to give each rider’s speed at any given time in the lap. If one rider is even just a couple of seconds quicker than the other, he will be at a different spot on the racetrack, making any comparisons of speed invalid. A histogram breaks down the data into intervals and displays how much time the data spends in each interval. 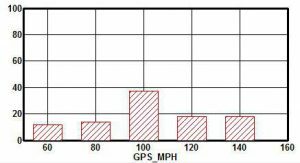 This histogram shows speed, but the format is especially useful for looking at channels such as throttle position or rpm. Another useful way to display data is using a histogram, which is a graph of the channel versus intervals of that channel. For example, a speed histogram can show how much time the motorcycle spends in each interval of 10mph. Any data channel can be shown in histogram form, and it is especially useful for quickly determining, for instance, how the powerband of the engine is being used in an rpm histogram. Histograms also play an important role in suspension analysis.